Vertex is the corporate personification of good to great. Since its founding 35 years ago, the company has steadily grown to serve more than 10,000+ corporate customers — including most of the Fortune 500. Its consulting and software are used to automate and simplify the tax process. 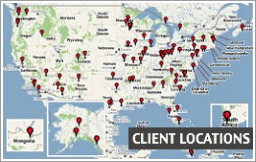 With offices in the U.S. and a growing global presence, Vertex is recognized as an employer of choice. One way they achieve that is through careful shaping of their culture — and constant learning that involves everyone. Tom Terez has advised the Vertex Engagement Team, drawing on his work with nearly 30 similar teams, councils, and steering committees over the years. He has also led sessions of the company’s Leadership Guild, a series of monthly forums for discovery and dialogue. Our Employee Satisfaction Team had been meeting for several months and progressing slowly. Then we had the good fortune to hear Tom Terez speak about workplace improvement at our company, and we had a follow-up meeting with him. With his guidance, we quickly coalesced around the idea of employee engagement — and all of a sudden our efforts took off. Through a continuing partnership with Tom, we have completed our research, made recommendations and seen them implemented, and launched a self-organizing learning group that provides opportunities for our people to become engaged as we explore ideas that will strengthen our workplace. Tom is a wealth of knowledge with a great style and sense of humor. He is adept at quickly understanding your culture and creating an approach that is rooted in his years of experience but also tailored to your organization. He is an inspirational coach and mentor to our team and to our company. Each year, KEMBA Financial Credit Union brings employees together for its All Staff Training Day. Held on a bank holiday so everyone can attend, it includes a fun lunch and a learning session. KEMBA’s best workshops have been those that mix equal parts of inspiration, information, and fun. 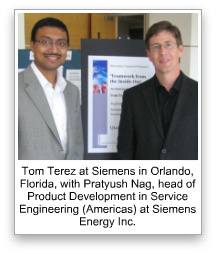 The company’s HR manager, Diana Fahle, had heard Tom speak at a conference. When it came time to plan the next Training Day, she called — and Tom met with Diana and the CEO to learn more about their vision for the big day. In a second meeting, Tom brought a draft agenda based, and they worked together to add detail. In a third meeting, they reviewed the polished session plan and looked forward to a great day. Then it happened — a big snowfall the night before caused major traffic tie-ups as people made their way to the meeting site. The workshop got started an hour late, but after braving the ice and snow and frigid temperatures, everyone wanted to make this their best Training Day ever. And that’s exactly what happened. What a fun-filled and inspiring day we had! Tom planned the day down to the very last detail — no stone was left unturned. We especially enjoyed The KEMBA Challenge game show, and the breakout sessions turned out great ideas that we’ve already put into action. Tom truly challenged us to take risks and speak out, and what a difference it has made, both for our employees and for those credit union members we are here to serve. Thank you again for a terrific experience! Over the years, Tom Terez has delivered keynotes, other talks, and workshops in 40 states and overseas. He speaks to a wide range of groups: private-sector companies, public-sector agencies, healthcare organizations, schools and universities, associations, and more. The following testimonials are from human-resource professionals. He’s a frequent speaker at HR events, having led sessions at HR conferences in New York, Minnesota, Idaho, Florida, Alabama, Indiana, Missouri, Colorado, Arkansas, Rhode Island, Iowa, Wisconsin, Tennessee, Arizona, Texas, Ohio, Jamaica, South Africa, and elsewhere. As a mid-size community hospital system comprising three distinct hospitals, the organization had strong employee relations and an excellent working environment. The VP and her colleagues wanted a day-long workshop to uncover ways to make a good workplace even better. There would be 60 participants, and this is where the planning process got tricky. People would be coming from very different areas of the system — and bringing different perspectives. The attendee list included the senior management team, program and service directors, managers, supervisors, coordinators, leaders of four unions, and front-line staff on the Quality of Worklife Committee. Early into the session, participants completed an assessment tool. Then they plotted their individual survey responses on a series of wall posters — creating an instant and easy-to-interpret compilation of strengths and improvement opportunities. This led to a series of progressive conversations in which people explored the results and gained new insights. They went on to use this information to craft action plans for their immediate work areas and for the system as a whole. Tom created an energy in the room that was contagious. He has the power to bring a diverse group of managers together — and to guide them in identifying and focusing on the real issues. I thoroughly enjoyed this workshop. Tom created a non-threatening environment that opened the way to interactions among peers. He also opened our minds, helping us see how we all can contribute and make the workplace more effective. As a major teaching hospital and research center, the University of Colorado Hospital doesn’t just stay current with the latest advances. It creates many of those advances, not only in the clinical area, but also in administration. Much of this is driven by ongoing learning. So when the hospital’s HR leaders began planning an end-of-year gathering for 200 managers, directors, and vice presidents, they asked Tom Terez to deliver a talk — but not just any talk. They wanted a session that had enough substance to engage an audience full of people with advanced degrees. They wanted the session to appeal to a diverse group — two-thirds from wide-ranging clinical backgrounds, the rest from business backgrounds. And they wanted it to be fun and tastefully humorous, to go with a festive holiday lunch immediately following the talk. The day was a big success, and the location certainly helped. The group met on the unfinished floor of one of the hospital’s brand-new buildings. It was a great reminder that the work of building a better workplace is an ongoing process that can and should involve everyone. You are genuinely gifted at what you do — inspirational, entertaining, and very informative. Thanks for giving me some wonderful ideas and techniques! You have an obvious passion for what you do, and it’s contagious. I loved how you involved and engaged our group. Great job! During the 1990s, Tom did considerable work as a group facilitator, guiding teams in analyzing situations, generating ideas, reaching consensus, and planning next steps. Facilitators are supposed to remain neutral at all times — they keep the group moving forward without commenting on content or taking sides. It’s a tough job! The Internal Revenue Service uses facilitators in a variety of ways. One of these is with its employee satisfaction survey. After work units complete the survey and receive a report of summary survey data, employees come together to talk about it, learn from it, and develop an action plan. Facilitators add value by serving as the process guides for these important conversations. In preparation for a rollout of the latest survey figures, the IRS organized a facilitator workshop. They wanted to bring in an outside speaker who had extensive facilitation experience AND a thorough understanding of employee satisfaction and workplace-improvement issues. Tom fit the bill. In advance of the session, he spoke extensively with his IRS contacts, shaping and refining the content and approach. I’ve been to canned presentations, and this wasn’t one of them. Tom did a great job of tailoring the workshop to our group. Thanks for an extremely empathetic session. Minnesota Rehabilitation Services helps people with disabilities achieve their employment and independent living goals. The agency has more than 300 employees, and its leadership has been striving to make a good workplace even better — by focusing on possibilities, moving the focus from “I” to “we”, and building a culture in which everyone eagerly contributes. To strengthen the change process, a planning group organized a two-day gathering of all staff. The first day involved a wide range of informational briefings, inspirational talks, and ice-breakers. The second day was more of a working session, with Tom guiding the group in a series of discoveries, conversations, and meaningful activities. In a concluding dialogue facilitated by Tom, people teamed up across offices to share success stories and generate improvement ideas. These ideas are now being used to bring about a new round of improvement throughout the organization. Your work with us exceeded our best expectations. The evaluations clearly showed that staff were engaged by your presentation and took away many things of value. I am so impressed with how you incorporated your ideas and insights into the events and messages of the first day. I feel so fortunate that we heard about you and were able to have you serve such an important role in our event. In Alaska state government, a labor-management committee organizes a major workshop each year for supervisors and labor-relations personnel. The training is delivered in three of the state’s biggest cities. It’s funded by the Alaska Public Employees Association/AFT, which represents state-government supervisors. The committee learned about Tom’s public-sector experience — he has worked with government agencies on the national, state, county, and city levels. Through a series of phone conversations, they worked together to tailor a day-long workshop. Tom went on to lead sessions in Anchorage, Juneau, and Fairbanks. 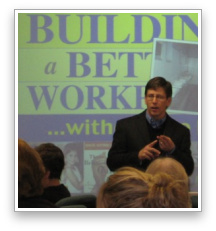 Tom is a wonderful speaker who keeps you motivated to listen and learn. There was great participation with attendees, and I left with all sorts of ideas and tools. This is the most interesting workshop I have had yet. Back in 1999, Tom Terez spoke at the All States Quality Conference, leading a two-hour session for quality advocates from state governments across the country. One of the attendees was Nathan Strong, who arranged for Tom to visit with his colleagues in the South Carolina Quality Improvement Network. Since then, Tom has worked with the state’s Office of Human Resources, Department of Health and Human Services, Department of Juvenile Justice, and Employment Security Commission. In the session for state HR leaders, the learning unfolded over two days. On the first day, participants completed a survey to uncover strengths and improvement opportunities in their work areas. Tom analyzed the input that evening and prepared a summary report. The next day, participants used their new insights to develop meaningful action. Tom’s engaging, insightful presentation really captured the attention of our workshop participants. He combines rich experience and powerful ideas with a warm, personal style. Outstanding! 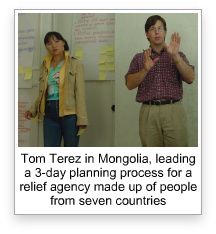 Tom Terez traveled 7,000 miles to conduct a three-day workshop for ADRA Mongolia. Based in the capital city of Ulan Bator, ADRA Mongolia is a development and relief agency with projects in education, food security, health, micro-enterprise, adventure-based learning, and agriculture. At the time of his trip, the organization had nearly quadrupled in size over the past three years and was staffed by 36 Mongolians and a dozen more people from eight other countries. The session was held in an old observatory — the perfect setting for a group with long-range vision. As the workshop unfolded, four big challenges came into clear view: the rapid growth in organization size, a growing demand for its services, tremendous diversity, and the age-old problem of limited funds. Tom facilitated with a light touch, letting the ideas emerge and take shape while working to build consensus among 48 people from nine nations speaking two different languages. A three-day workshop in a cross-cultural setting with people from nine countries is no easy task for any person. Yet Tom facilitated in a masterful, considerate manner. It was who Tom is more than what Tom said that really won our hearts and minds: inspirational, down to earth, responsive, simple, sincere, stimulating, optimistic, humorous, and much more.